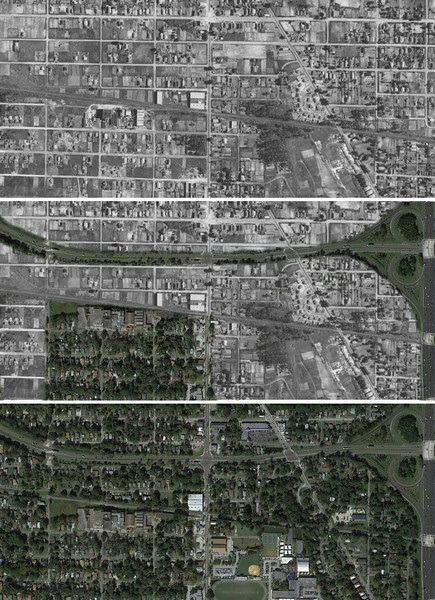 An interesting comparison of 1943 and current aerials illustrating the impact of expressways penetrating through various Jacksonville neighborhoods and districts. Railroad Row was a portion of downtown where streets were lined with wholesalers, retailers, restaurants, hotels and freight depots catering to the city’s early 20th century rail lines. Redevelopment of this district began in the 1950s, with the elimination the area’s riverfront wharfs. Railroad Row declined with the 1970s closure of the Jacksonville Terminal. By the end of the 1990s, most of its buildings had been demolished to accommodate the ramps of the Acosta Bridge and the elevated JTA Skyway system. Brooklyn developed as a working class neighborhood for African-American railroad workers following the end of the Civil War. Major roadway projects, such as the construction of I-95, the Acosta Bridge, the widening of Forest Street and Riverside Avenue have forever changed the neighborhood’s landscape. Now a hotspot for infill development, Brooklyn’s historic flavor is being replaced by a network of Texas Doughnut-styled multifamily developments. Durkeeville originated as an African-American streetcar suburb during the early 20th century. 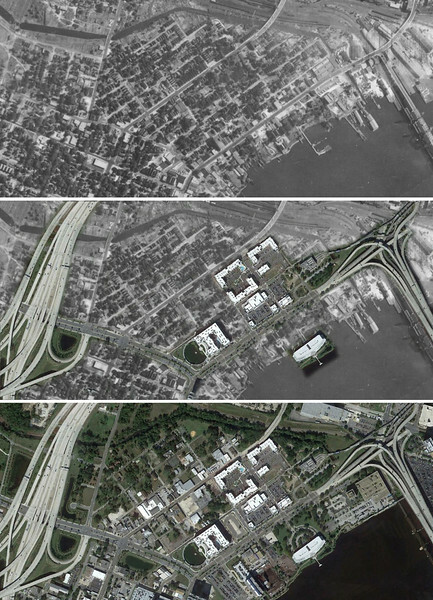 During the 1950s, it was negatively impacted by the construction of the Jacksonville Expressway (I-95) and the 20th Street Expressway (MLK Jr. Parkway). 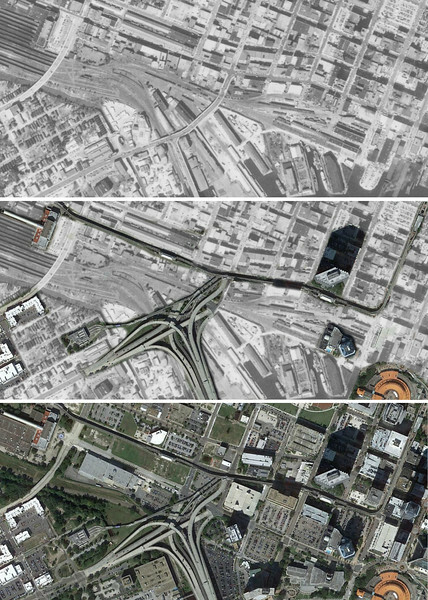 While the expressways severed its ties with downtown, being dominately black and on the other side of the highway also left it out of site for the city’s failed urban renewal experiements of the late 20th century. Today, it remains one of the city’s most intact neighborhoods.